*Whether you hate him or find him entertaining (I fall somewhere in the middle, for the record), I'll always credit Guy Fieri with popularizing that phrase, whether he deserves it or not. Chicken is definitely my protein of choice when I'm making supper. We'll have beef a couple of times a week (almost always in ground form), pork at least once (usually exactly like this)(because if it ain't broke, don't fix it), and scallops once in a blue moon. More often than not, though, chicken is on the menu. My boyfriend's mom turned me on to this recipe; she made it for us when we were visiting over the holidays. 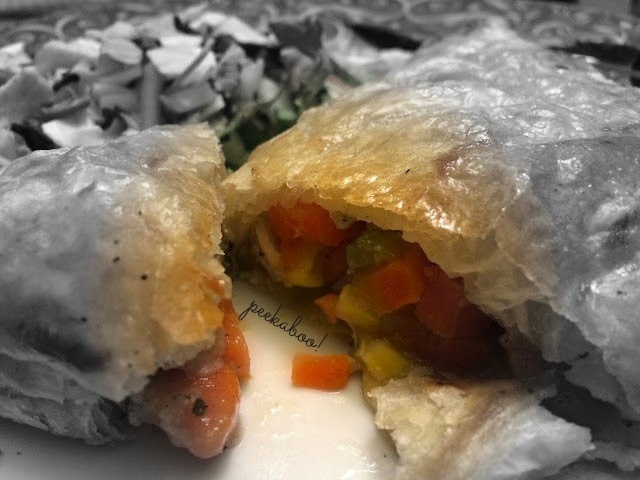 I might've added a few twists of my own (and I would encourage you to do the same), but the basic idea is that you plop the filling for a chicken pot pie onto a square of puff pastry, fold it into a triangle, and bake it, resulting in a cute little package full of comforting goodness. I daresay I'll never get tired of chicken, especially since there are endless ways to prepare it! As those ways go, this one is definitely worthy of a repeat. On a lightly floured surface, roll pastry sheet out to a 20x20-inch square. Cut that into 4 5-inch squares and place these on a baking sheet lined with parchment paper, cover and chill. Melt butter in a skillet over medium heat. Sauté onion, celery, and carrots until softened, about 10 minutes. Add peas and corn; sauté 3 minutes. Sprinkle thyme and flour over vegetables; sauté 1 minute. Raise heat to medium-high and stir broth and mustard into pan. Add chicken; cook until sauce is thick, 7 to 10 minutes. Add seasonings to taste, then transfer to a bowl and let cool. Brush edges of pastry squares with egg. Spoon 1/4 of chicken mixture into the center of each; fold to form a triangle. Seal edges. Brush the tops of the triangles with remaining egg. Cut 2 or 3 slits in top of each and chill for 15 minutes. Bake turnovers in preheated oven until golden, about 30 minutes. Let cool 5 minutes and serve. A wonderful idea! Those pie pockets must taste really good. This looks delicious, Grace! I love the idea of a hand held/individual chicken pot pie pocket. This is much appreciated, as I gaze into a pot of chx breasts in mid-poach and wonder what the heck I am going to do with them. The pockets look awesome! I was just saying yesterday I'd like to find a good recipe for pot pies and this just may be the one. Thanks! Such a nifty idea, Grace. I've been eyeing a pot pie recipe that has a cute lattice puff pastry top, but this is even better. Nothing more comforting, is there? I can't say no to anything stuffed in puff pastry. Always a good life choice! Handheld chicken pot pie? Um, YES PLEASE! They look tasty. Major yummy, I'd love to hand hold this beauty! What a great idea! Sounds really delicious. These look delicious....chicken pot pie is one of my favorite comfort foods, so your pies are calling to me. I love chicken turnovers and make them quite often! These ones look absolutely mouthwatering! What a great idea, Grace! I love small versions of dishes.....Fun and delicious! Guy Fieri has his moments ;) This sounds delicious - I'd like one right now! Though of course Id fill mine up with veges! Even better than a chicken pot pie -- because you can hold it in your hands! Guy Fieri is not as bad as some of them, I guess. Chicken is a favorite around here too, Grace. We usually have it three times a week, fish once or twice a week and pork maybe once a week. It depends on my mood but chicken is the first go to and oh so versatile!!! That sounds great, Grace! Chicken is usually my first go-to meat. This looks like a real family pleaser Grace!